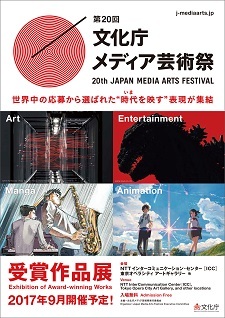 The 20th Japan Media Arts Festival list has been announced. The recipients include those from Japan, America, Brazil, Bulgaria, England, Korea, Mexico, and Russia. Aside from the awards, various anime and manga titles also made the Jury Selections. The lists are provided for both the Animation and Manga Divisions. If I am not mistaken, this is Yamada Naoko-san's second award in the Japan Media Arts Festival Awards as she also won an award during the 18th Media Arts Festival for Tamako Love Story. Yes. Blue Giant is truly amazing. Also a lot of interesting things listed. The Brazilian awarded name is Alê Abreu. I've yet still to watch Kimi no Na wa but I'm not surprised to see it winning grand prize for the Animation Division. Really happy to see Blue Giant win the grand prize for the Manga Division. Ayyy, Your Name deserves them awards tbh. Hmm.. blue giant manga got so many manga award! Shin Godzilla is the only one that deserves the list. from Japan, America, Brazil, Burgaria, England, Korea, Mexico, and Russia. Anime: Koe no Katachi, Kimi no Na wa.